It should come as no surprise to any conservative that the SWAMP is looming over the MIGOP State Convention scheduled to take place Friday and Saturday at the Lansing Center. While we tell voters we are going to drain the swamp, typically the swamp is coronated at these kind of affairs. It’s part of the immense hypocrisy that stains our party. The swamp has its chosen candidates picked out. At the top of the ticket is former State Rep. Laura Cox, who lost a winnable State Senate seat to a completely unknown Democrat no-name challenger last year. After demonstrating her inability to connect with the public, she is going to be rewarded with the biggest leadership position in the party. It doesn’t get much more swampy than that. Making matters worse, Cox is running a gutter campaign against her opponent Gina Barr, who was Director of Women and Urban Engagement for the Republican National Committee and worked as a regional field director helping win elections for Republicans across the country. The special interests are deluging delegates with false information urging them to vote for Cox, whose record of supporting tax hikes, spending increases, and crony capitalism in the state legislature is well-known. Will National Popular Vote Be Resurrected During Lame Duck Session? There has been an impressive amount of grassroots fervor that has resulted from the National Popular Vote push by Republican legislators in Lansing. As I am sure you are aware, the National Popular Vote scheme would destroy the electoral college and game our system so that voters in Los Angeles, Chicago, New York City, and other liberal-dominated population centers would control the entire nation forevermore. It would have meant Hillary Clinton winning the Presidency in 2016, and all the power of Michigan voters would effectively be nullified. After it was revealed that Republicans were wined and dined with a trip to Hawaii and other lavish trips paid for by lobbyists, outrage erupted immediately. Legislators were inundated with calls and emails from angry constituents, and we were given assurances that the legislation in the state House and Senate to enact NPV was dead. House Speaker Tom Leonard admitted as much. Then I saw that he voted for House Bill 5325 (HB5325), legislation that hikes property taxes on homeowners for the purposes of crony giveaways to well-connected private interests. This scam is called a “special assessment” and a similar scheme may be on a local ballot in your municipality in the near future. This fraud is now picking up steam because of Leonard’s actions. All of us who have been following the saga of Senate Bill 97 (SB97) are beyond disgusted. It’s one of the most egregious legislative power-grabs in recent memory. According to MichiganVotes.org, the measure if passed would give “state and local government agencies the power to enter into joint operating arrangements for building hospital and transportation businesses” and would allow private operators to “benefit from tax exemptions and its governmental partner’s power to impose property taxes, borrow, take private property using eminent domain and more.” This is as anti-free market as it gets. The bill predictably sailed through the Senate without much debate and discussion. Senate Majority Leader Arlan Meekhof, known for his lack of spine and principle, fast tracked it last year. The Senate committeemembers who approved SB97 were all bought off by the hospital and transportation industries that will make a killing off the legislation, and all but four Senators voted to approve it during the full Senate vote. Sens. Colbeck, Hune, Emmons and Shirkey were the only hold-outs. The House committee that approved SB97 was similarly bought off by the monied interests that will benefit from the bill. This is how the Lansing swamp operates. Right now, the fate of SB97 is in the hands of House GOP leadership. 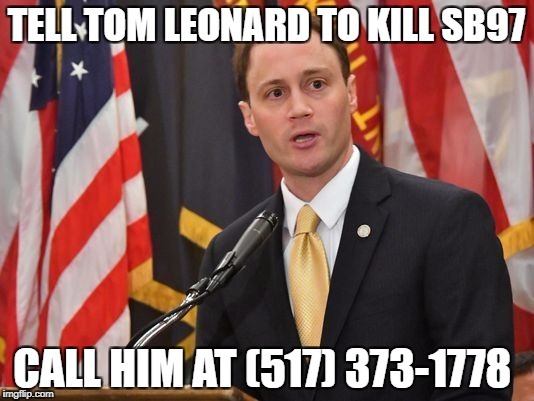 House Speaker Tom Leonard has the reputation of being a staunch conservative. He is running for Attorney General right now off of his conservative bona fides. To his credit, Leonard is no Arlan Meekhof. He seems far more fair-minded than his predecessors, but who is funding Leonard and the rest of the House GOP leadership?